I am starting on my blog again, posting monthly, and I’m going to do it without reconnecting with Facebook or Twitter. I’ll post them on both my WordPress blog site and my website and the inestimable Richie will put them on his vast social media empire, too. But please, if you like reading my posts, go ahead and press that little “follow” button in order to be notified of my new posts. I really appreciate it and as I do your interest and your support. So this month’s post falls under the heading of buy my beautiful notecards why don’t you? It is, after all, the season for sending out little cards. Sure, I don’t have theme- specific ones, but you can use your imaginations. I’ve got pears and aren’t there partridges in pear trees for one holiday? I’ve sheep, lots of sheep, and that says to me Thanksgiving, hands-down. The little landscapy ones can be used for all sorts of themes. I just can’t think of which, exactly, at this moment, but I’m sure you can. And of course there’s the pigs and the horses. Now that I think of it, the pigs, although I think they are lovely, might be a tad insensitive for, say, Thanksgiving or Christmas or Hannukah. Okay, ixnay on the pigs for the holidays. But the horses would work. You know, “over the river and through the woods to grandmothers house we go, the horse knows the way…” etc. And that Robert Frost poem about stopping in the snowy woods and the pony does that little shake of the harness thing. So go here and check them out. And thanks. I am sitting on the couch in the really nice and big room that Richie booked for us in a Maryland hotel, three-quarters of the way to Virginia, where we will be for a bike thing. Well, it’s a bike thing for Richie. 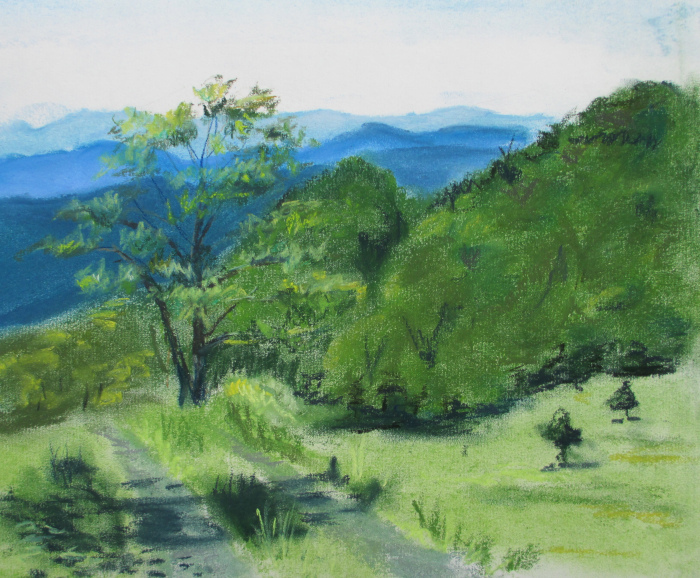 I take my paints and Maybelle (my sometimes traumatized GPS) and Buddy (the adventure Maltese) and head out to the Blue Ridge Mountains, in search of vistas. And there are vistas a-plenty. When I find one that gives me that zing, I set up to paint. Despite people coming over to look at what I am doing, which makes me very self-conscious, I persevere until I get a painting done that I like the looks of. For those of you who paint outdoors, or en plein air as they say, you know that when you look at that picture later, you will smell the air, feel the sun or shadow on your skin again and hear the bird calls—it is that absorbed into you. It becomes more than a memory; it becomes a tangible part of your life. After completing a satisfying painting, I load everyone back into the car, we head back to the cottage where we are staying and wait for the bicyclists to get back. They are riding a ridiculous amount of miles on back-woods dirt roads, and they feel very manly for doing it. I am satisfied with my day, they are satisfied with their day and when we meet again at the end of the day, we are complete.